Digital flood-inundation maps for a 6.4-mile upper reach of Indian Creek from College Boulevard to the confluence with Tomahawk Creek, a 3.9-mile reach of Tomahawk Creek from 127th Street to the confluence with Indian Creek, and a 1.9-mile lower reach of Indian Creek from the confluence with Tomahawk Creek to just beyond the Kansas/Missouri border at State Line Road in Johnson County, Kansas, were created by the U.S. Geological Survey in cooperation with the city of Overland Park, Kansas. The flood-inundation maps, which can be accessed through the U.S. Geological Survey Flood Inundation Mapping Science Web site at http://water.usgs.gov/osw/flood_inundation/, depict estimates of the areal extent and depth of flooding corresponding to selected water levels (stages) at the U.S. Geological Survey streamgages on Indian Creek at Overland Park, Kansas; Indian Creek at State Line Road, Leawood, Kansas; and Tomahawk Creek near Overland Park, Kansas. Near real time stages at these streamgages may be obtained on the Web from the U.S. Geological Survey National Water Information System at http://waterdata.usgs.gov/nwis or the National Weather Service Advanced Hydrologic Prediction Service at http://water.weather.gov/ahps/, which also forecasts flood hydrographs at these sites. Flood profiles were computed for the stream reaches by means of a one-dimensional step-backwater model. The model was calibrated for each reach by using the most current stage-discharge relations at the streamgages. The hydraulic models were then used to determine 15 water-surface profiles for Indian Creek at Overland Park, Kansas; 17 water-surface profiles for Indian Creek at State Line Road, Leawood, Kansas; and 14 water-surface profiles for Tomahawk Creek near Overland Park, Kansas, for flood stages at 1-foot intervals referenced to the streamgage datum and ranging from bankfull to the next interval above the 0.2-percent annual exceedance probability flood level (500-year recurrence interval). The simulated water-surface profiles were then combined in a geographic information system with a digital elevation model derived from light detection and ranging data (having a 0.429-foot vertical and 0.228-foot horizontal accuracy) to delineate the area flooded at each water level. The availability of these maps, along with Web information regarding current stage from the U.S. Geological Survey streamgages and forecasted high-flow stages from the National Weather Service, will provide emergency management personnel and residents with information that is critical for flood response activities such as evacuations, road closures, and postflood recovery efforts. 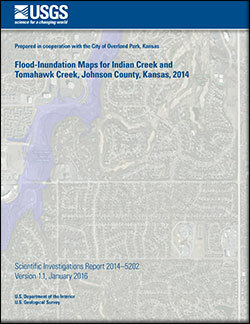 Peters, A.J., and Studley, S.E., 2014, Flood-inundation maps for Indian Creek and Tomahawk Creek, Johnson County, Kansas, 2014 (ver. 1.1, January 2016): U.S. Geological Survey Scientific Investigations Report 2014–5202, 11 p., http://dx.doi.org/10.3133/sir20145202.